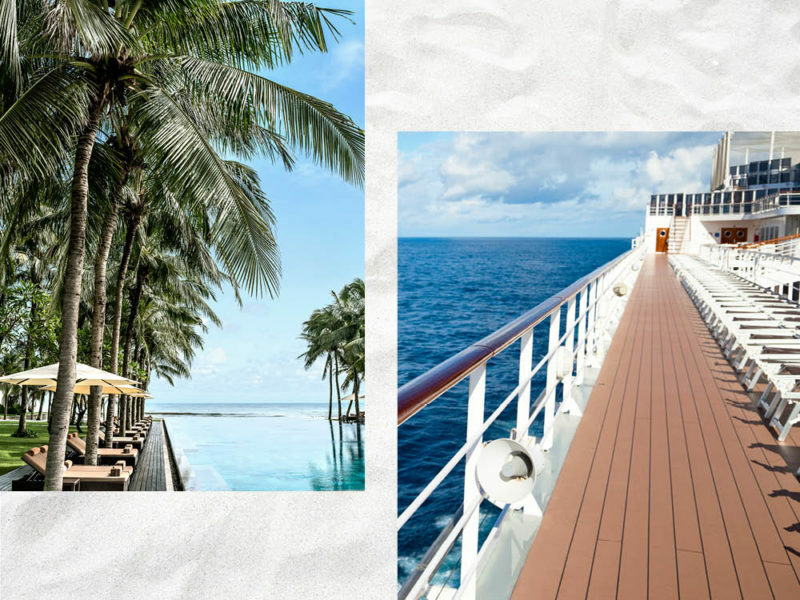 Resort or Cruise? Both holidays have their pros and cons. A cruise and a resort holiday each have its pros and cons, but one will be a much better fit for your needs. As part of our ongoing ‘Everything you need to know about cruising‘ series we do the research to help you find your next holiday. It might not be the toughest decision you’ll ever have to make, but with precious little annual leave up your sleeve, the question must be asked: how best to please your inner lounge lizard – book a cruise, or lock in a week at an all-inclusive resort? To compare apples with apples, we not only take a look at the difference between mid-range all-inclusive resorts and standard cruises where the fare covers accommodation, meals in the main restaurants and activities, but stand-alone ‘pay for everything you eat/see/use’ resorts. The wave pool and sky diving simulator are just a few of the activities on board the Quantum class of ships from Royal Caribbean. Ovation of the Seas is a Quantum class ship that offers cruises from Australia. It’s not the plenitude of restaurants or cacophony of activities like bumper cars, wave riding, indoor sky diving et al that are the clear advantages of cruising (although they are up there); easily the biggest advantage of booking a cruise holiday is the promise of visiting multiple destinations and only ever having to unpack once, as well as not having to manage a complex itinerary of connections and transfers, says Deb Long, manager and owner of Weston Cruise & Travel. “Rather than having to worry about logistics of transport, destinations on the itinerary all come to you and you can experience a wide variety of new places and cultures just by getting out of bed in the morning,” she says, adding that ships can also seek out the best weather for their passengers. Concerned you might get bored? Not only do you have a huge range of cruise lines and cruising styles (ocean, river, expedition) to choose from to fit your personality type, but modern-day ships are jam-packed with onboard activities, from water parks and bumper cars to zip lining to circus schools and indoor skydiving, and daily schedules are filled with wine tastings, Vegas-style shows and educational programming. Zero in on the right ship for your group (check out our dummy’s guide to cruise lines for help) and there will always be a new activity for each individual member of your group to enjoy, says Carl Frier, managing director Australasia, Cruise 1st. The positives don’t end there. Dining options on large cruise ships tend to be more varied, often covering a wide range of cultures so you can easily have Japanese for lunch, Italian for dinner and French for snacks, with food available 24 hours a day, and when it comes to service – well, it’s usually faultless. This is in stark contrast to the greatest problem of resorts: that the restaurant menus in the two or three (if you are lucky) eateries remain more or less identical throughout your stay. And then there is the service. So far so rosy, but this isn’t to say cruising isn’t without its downsides. Cruise fares are incredible daily value for all the inclusions, but you do need to budget for onboard spend on things like alcoholic drinks, wi-fi, meals in the ship’s specialty restaurants, shore excursions, commemorative photos and the odd cappuccino or two. Although these days most cruise lines throw in ample onboard credit, it still pays to be prepared and budget for these extra items – as well as daily gratuities charges. Occasionally crowded pools and itinerary changes, plus small rooms if you haven’t done your homework, round out the list of possible downers. A great option if you want to visit multiple destinations in a fun, activity-heavy environment and can budget appropriately for the onboard extras. Fighting in the resort’s corner is the fact that travellers are never restricted by port hours. Rather than having to rush back to the ship lest it sail off without them, holidaymakers can take their time both in and around the resort. Sunset walks by the ocean, entire days relaxing on the beach (which is likely to be less crowded than those close to ports) and long stretches on the golf course are all infinitely possible. Also a plus is space within the resort itself: with most properties (particularly in Asia and around the South Pacific) boasting rooms larger than cruise cabins, and swimming pools that tend to be larger than on a ship. That’s not to say resorts aren’t without some downsides of course. While budget control does appear to also be in the corner of the resort-style holiday, the included alcohol and coffee may just not cut it for you. Being forced to drink the ‘included’ beverages or meals can be somewhat painful if they are not to your taste. So, the budget can be blown by not doing your homework on inclusions. At a bulk standard resort of course, costs can quickly add up. A captive audience can often mean eye-watering prices in the resort’s restaurants, bars, activity centres and pretty much anywhere else you have to give the lovely chap or lady behind the desk your room number. Depending on the resort’s location, travellers may find they are limited to its immediate area – a problem if you’re keen to check out the nearest town or learn about the local culture or way of life. Unless you’re keen on repacking and making another trip, settling on a resort also often means you’re committed to only one destination and the type of holiday experience that can be negative if you check in and discover you’re not all that enthralled with either the destination or the property itself. More so than cruising, dining options and service at resorts can be hit and miss and you may have to rely on personal recommendations from friends and family as well as online travel reviews to find a resort that will tie in nicely with your expectations. Resort holidays tend to be good for those who desire a truly relaxing holiday with zero time constraints or demands. A great fit for those happy to do a deep dive into a single destination as well as those keen to spend a lot of time enjoying water sports and other activities: these tend to be complimentary at all-inclusive resorts, whereas they’re often an extra charge on standard cruises and at regular resorts.